Star Wars fans will recognize the landscape. Actually, some of the Endor scenes in the movies were filmed not far from here on Vancouver Island. This photo was taken in Washington Park in the city of Anacortes, Washington. Two of the trees pictured have special cultural significance in the Pacific Northwest. 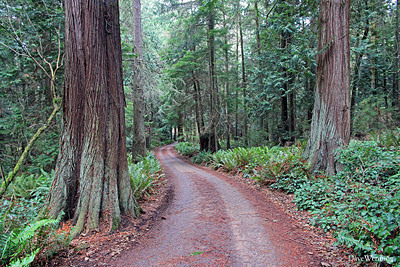 The large trunks in the foreground are Western Redcedar (Thuja plicata). They are actually Arborvitae meaning "tree of life," and not true cedars. An alternate name is Giant Arborvitae. We know the wood of this tree for its beauty, durability and wonderful aroma. Dust Lichen imparts the gray-green color to the bark. Western Redcedar is the official tree of British Columbia, Canada. True to its name, Native Americans revered the tree as the "life-giver." Some called themselves "People of the Cedar." Wood, bark and roots were all used to make planks and posts for housing, canoes, clothing, textiles, mats, baskets, bentwood boxes, art works, masks and medicines. Totem and story poles were carved from the trunks. Elaborate carved and painted cedar panels decorated houses. It was a special skill to strip some bark from a tree and leave it to survive and heal itself. Trees marked with scarring from human activity are designated cultural heritage trees. Those that date before 1846 are considered archaeological sites and protected by law in Canada. The spindlier trees growing from the stump in the center of the photo are Western Hemlock (Tsuga heterophylla). The trees typically germinate in the rotted wood of so-called "nurse logs" which have fallen to the forest floor. As in the photo, old, rotted stumps also serve this purpose. The tree is extremely shade-tolerant. Saplings may linger several years in the shady understory. Then, when an opening in the canopy provides some light, their growth rate will accelerate and they assume their place among the giants. In the circle of life, a tree downed by the wind might first provide such an opening. Later, it will foster new generations as a nurse log. The presence of mature Western Hemlock is an indicator of a late-successional forest. The state tree of Washington, Western Hemlock is a primary source of lumber in the Pacific Northwest. Like the Redcedar, it was also important to indigenous peoples of the Northwest Coast. The bark is high in tannin which was used for treating hides. Textile dyes and paints were made from the bark. Hemlock pitch and bark were used to prepare medicinals and cosmetics. These included liniments, cold remedies, diuretics and hair remover. The wood is durable and easily carved and was shaped into tableware, bows, basket rims and dip-net poles. Shoots were chewed as an appetite suppressant when food was scarce. The forests of the Endor moon, home of the Ewoks and the site of a speeder bike race are not fictional places. For lovers of nature, they may be visited in the Pacific Northwest, from Alaska to Northern California. Like great mythic adventures, the real stories from these forests can be endlessly fascinating. Nice post! I remember that scene in Star Wars when they were zipping through the forest. Western red cedars are my totem tree, I feel a strong affection for them. An old growth cedar was outside my bedroom window growing up, and I was always comforted when its lower branches brushed against my second-floor windows during the often blustery East Wind coming down the Columbia Gorge. Not to over-geek, but in Return of the Jedi the Ewoks lived not on Endor but on its moon. Visiting the forest profiled above should therefore be referred to as visiting the Forest Moon of Endor, not as visiting Endor itself. Hi Jill. Glad you enjoyed the post. I am also very fond of the cedars. The post was really more about trees than movies, but I did the best I could. Very awesome post. The overhead fly in shot with temples coming out of the forest was taken in Guatemala at Maya Ruins of Tikal. google the images, pretty cool stuff. I guess you can go to two places to visit the Forest Moon of Endor.